Click here for questions related to our bill pay upgrade. When will I be able to use my new card? The new cards will become active on September 17. They will not work prior to this date. Please use your current TCCU debit card until then. Can I use this card for credit-based transactions? Yes. The new cards have the same functionality. You may use it as a credit transaction to earn awesome rewards on your TCCU checking account, or as a debit transaction using your PIN. You may activate your new card when you receive it by calling 1-800-448-8268. This will also allow you to change the PIN. Remember, even though the card is activated, you will not be able to make transactions until September 17. What do I do with my old card? We suggest cutting it up and tossing it in the trash. Or you may leave it with us and we will be glad to shred it for you. Remember to do this after September 17 because the new cards will not work until then. What do the new cards look like? They look great! Here’s a pic to help you know which one to keep. Our business accounts will receive a gray card. You should receive your new PIN approximately two days after receiving your new card. You may change your PIN if you desire. If you like your current PIN or don’t want another number to remember (oh, the memory struggle! ), you can use it on the new card. 🙂 To change the pin call 1-800-448-8268 or contact a Member Services Representative. 1. You received a letter in your July quarterly statement. Our e-statement users also received the same notification in their July 1 e-statement. Click here to read. We also sent notification in the August and September e-statements. Click here to read. 2. The debit card change was addressed in the quarterly newsletter. Click here. You received notification about the newsletter in the August paper statement and in the July e-statement. Newsletters are also available at both branches. 3. Instructions are also included when the card is mailed. Click here. 4. Online banking users received a message inside online banking on August 25. 5. TCCU also had lobby signage, flyers in the branches, digitally displayed in the monitors in the branches, and an awesome contest to be in a drawing for a big screen TV. 6. TCCU distributed an e-alert to debit card holders on Friday, Sept. 5. If you didn’t receive these notifications, we were using the contact information you provided us with during account opening. Please contact a Member Services Representative to update your information. Do I need to change any payments tied to my old card? Yes! Please do this as soon as possible. Any payments tied to your TCCU debit card will need to be updated. Remember the new cards will not be active until September 17 so check the date of your automatic payments before updating it. What if I didn’t get a new card? No problemo! If you haven’t received a card please call us at (940)851-4000. It may have been sent to the credit union. If we don’t have it, we will mail one to you faster than you can say “red leather, yellow leather” or we can print you one from our cool new debit-card-making machine… which takes a few minutes. You pick the best option and let us know! Why is the card changing? Because TCCU is always making things better for our members! This new debit card processor allows us the opportunity to offer you instant issue debit cards. This means when you have a lost/stolen card there’s no need to wait for a replacement in the mail! We can print it for you in less than 2 minutes at either branch. The same goes for any new accounts needing a debit card. Can I REALLY win a TV? Yes! You REALLY can. We’re not pulling your leg. Every time you use your new card from September 17-October 17, you will be entered in a drawing for one of two 55″ smart TV’s. Check them out at either branch. So swipe away, friend. Swipe away. How long does it take for my debit card to arrive? How can I change my PIN? Does my debit card work in other countries? What are stand in limits? How long does the card take to arrive? A Card takes 5-7 business days to arrive. The PIN is mailed first and the card will follow two days later. A card can be overnighted at a cost of $45 to our members. The term overnight actually means it takes two days. The production will take place the day after the order and is sent by Fed Ex overnight on the day of production. How can a member change the PIN? A member may choose their own PIN. They may come in and have an MSR update the PIN or when they get their card there is a number in the envelope where they can call and change it. Does the card work in other countries? The Card works most anywhere in the world except for Africa and eastern Europe The card can be deactivated 24/7 by calling our main telephone number. What are stand in limits? Stand in limits are $700 credit/POS and $300 cash. Stand in limits are rarely in place. “Stand in” means that our system cannot connect to MasterCard. You can call 800-588-9970 to activate your card 24 hours a day, 7 days a week. You can also stop by one of our branches where a member service representative can activate your card for you. How do I reset my PIN number on my Debit Card? If you know your current PIN you can call 800-851-4859. If you do not know you PIN currently you can stop by one of our branches where a member service representative can set a new PIN for you. I bought gas. Why is there a debit card hold on my account? If you use your PIN number when you purchase gas there may be a hold placed by the gas station that will stay on your account for (3) business days. The most common amount is $75, but it could be higher depending on the gas station. The reason is that when you use a PIN to purchase gas the gas station is not guaranteed to get their money, so they will preauthorize the amount where the pump will automatically stop.Â To keep this practice from happening just always use your card as a credit at the pump. It will still clear from your account but the gas station will not preauthorize the transaction for the large amounts like they do with the PIN transaction. Why is there a debit card hold on my account? When your debit card is used at a merchant the amount of the purchase is no longer available to you and will automatically be placed on hold in your account until the merchant clears the transaction amount from your account. When are my statements mailed out? Paper statements are generally mailed by the 5th of each month. Plus the US Postal Service can take another 3 days to get to your home. We strongly encourage you to Sign Up for E-Statements to speed the delivery. If you believe that your card has been lost or stolen, please call 800-791-2525. Or please call Texoma CU directly at 940-851-4000. Time is critical, please call right away. What is the limit on my debit card? Subject to your available account balance, TCCU debit card limits are set at $2,500 per day. This is broken into $500 cash at the ATM plus $2,000 at the Point of Sale (merchant). If this amount is not enough, then TCCU can increase this limit either temporarily or permanently based upon credit standing. What information do I need to Wire Money to Texoma CU? 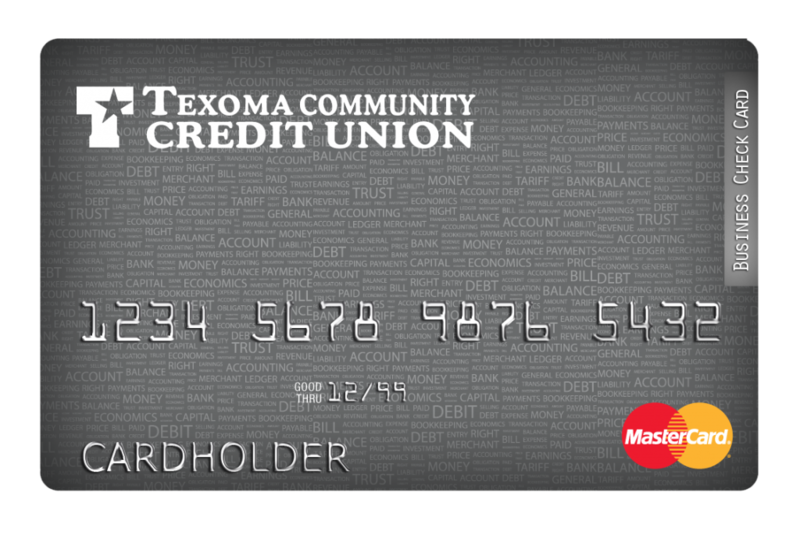 Who can join Texoma Community Credit Union? Click here for a complete list of counties and cities.